Self-Hypnosis for a Better Life presents an elegant, simple system you can use to improve every area of your life. The sound of your own voice is an incredibly powerful tool for speaking to and reprogramming your subconscious. 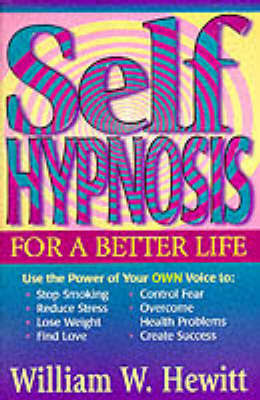 Self-Hypnosis for a Better Life by William W. Hewitt shows you exactly how to do it. You will learn that hypnosis is a safe, easy, and practical tool for personal transformation. Changing your subconscious mind will affect your conscious mind. You can do it effectively with hypnosis. Going to a hypnotherapist can be expensive and those tapes you've seen may not work. Self-Hypnosis for a Better Life solves both of these challenges by showing you how to make your own tapes. The sound of your own voice makes them even more effective. Each of the 23 scripts takes only 30 minutes to record. Simply read the script aloud into a tape recorder, replay the finished tape back to yourself, and reap the rewards of self-hypnosis. Attract love, solve problems, stop smoking, control stress, remember your dreams, improve self-confidence, and more with Self-Hypnosis for a Better Life. Get your copy today.